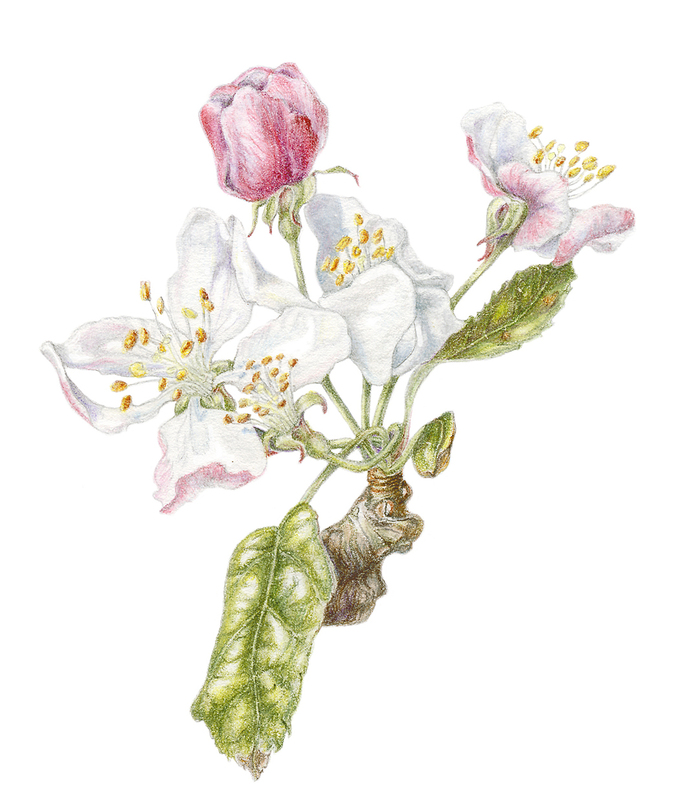 Tomorrow my husband and I will be driving up to London with the Crab apple botanical art pictures due to be exhibited at the RHS, Lindley Hall from Thursday 10 April until Saturday 12 April. We will set up the exhibition tomorrow afternoon and evening and then my husband will disappear until the next evening. I will be all on my own (sniff), but with other exhibitors of course, when we get the results of the judging on Thursday lunchtime. We have found a hotel not too distant from the RHS halls so I might even get a slight lie-in on Thursday morning. The exhibition will be open for the preview between 18:00 – 21:00 on Thursday evening. I think that this is meant to be for RHS members. By this time I hope that my husband has returned to either commiserate or enjoy. Either way, I think we will have a nice – but late meal in the evening. Everything is planned so far, but you know what happens to plans! The RHS Botanical Art Exhibition and Orchid show will be open to the public on Friday 11 and Saturday 12 between 10:00 – 17:00. 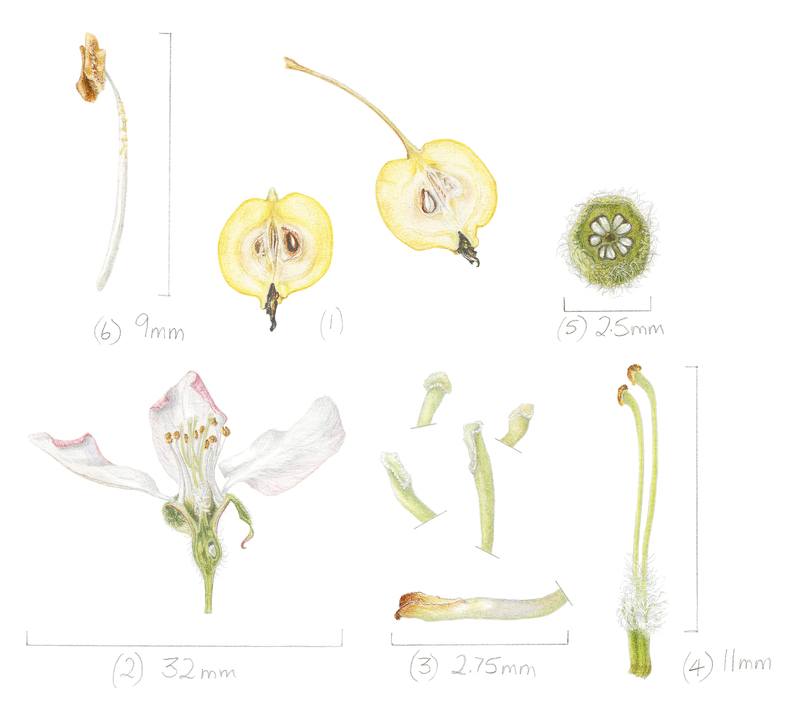 I understand that they are doing something new this year in that several well-known botanical artists (previous Gold medal winners) will be demonstrating their techniques. I will be very interested in that. So what am I doing now? Have you noticed that I am now looking ahead? This means that I think I have done as much as I can before we set off tomorrow morning – except to pack. Someone is going to look after the cats, so they will probably get spoiled to death. I have got everything together – I think. Pictures painted, framed and labelled. Some prints made – in case. Picture hooks, rope to hang the pictures….., a level to make sure they hang straight. Scissors. Oh I must take something to clean the glass! Visiting cards. Have I forgotten anything? I am trying to make the house habitable again – but that doesn’t extend to the shed – I will do that on Sunday. Imagine, I can start painting again on Sunday – if I am allowed. There is one picture remaining. I am attaching the elements from it as I have done with the other five. Bear in mind, I have grouped things to make it easier for the blog, but the whole picture does not have the same arrangement. Once I get back, I will put the pictures on my website: http://www.gaynorsflora.com. That means I might not get to paint on Sunday! We will see. 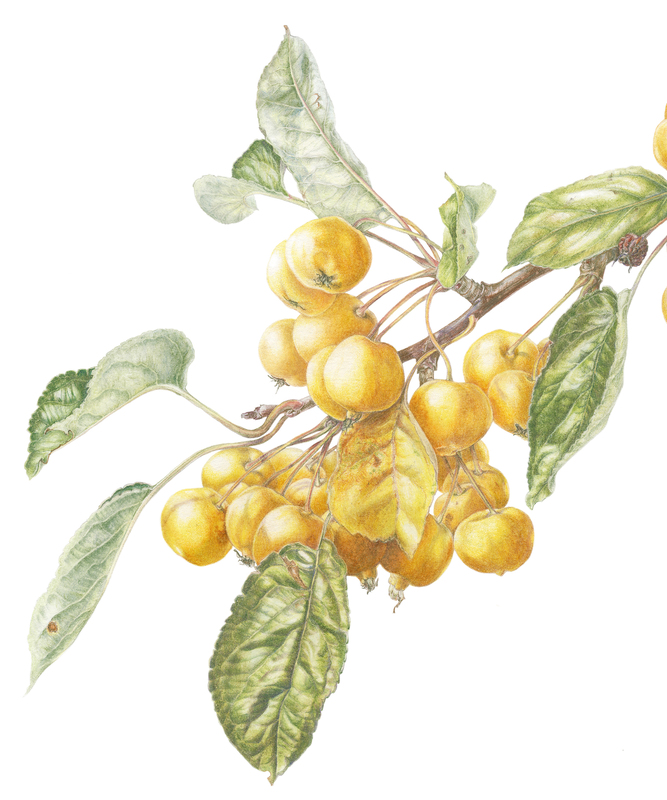 This is Malus x zumi ‘Golden Hornet’ in coloured pencil. Thank you Jane. See you both on Saturday. Your pencil drawings and paintings are extremely carefully done and beautifully executed! Great works! Hopefully. Just about to load up the car! Hei Meredith, thank you for your wishes. We need it. Don’t worry Robin will get a medal whatever tthe outcome. Birthdays Sat & Monday. Also anniversary time!